Learn about the four types of brake pads. 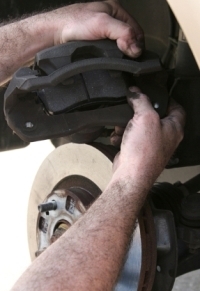 Brake pads are a necessary component of what may be the most important safety aspect of a vehicle. Your brakes work hard – their sole responsibility is to bring the vehicle to a stop, potentially saving the lives of you and your passengers. The first sign that you may need new brake pads is a high-pitched squealing noise when the vehicle comes to a stop. The noise comes from a soft-metal wear indicator that rubs against the brake rotor to alert the driver that new brake pads are needed. Other symptoms of faulty or worn brakes may include the vehicle pulling to one side, the brakes shaking or grinding and the brake pedal feeling softer when pressed. Knowing you need new brake pads in the first step; next is choosing the type to install. Brake pads are steel backing plates with friction material bound to the surface facing the brake disk. These pads convert the kinetic energy of the car to thermal energy through friction. When a brake pad touches a drum or a rotor, it becomes heated. This causes it to transfer small amounts of friction material to the disc or pad. The brake rotor and disk, which now have friction material on them, will stick to each other and provide stopping power. Semi-metallic brake pads contain a mix of 30 to 65 percent of metal and typically include chopped steel wool or wire, iron powder, copper or graphite mixed with inorganic fillers. They also contain friction modifiers that bond all the components together. These pads have a reputation of being durable and of having excellent heat transfer; however, they wear rotors down quickly, are noisy and may not perform up to par in cooler temperatures. Sometimes listed as organic or NAO, these types of brake pads are made from fibers such as glass, rubber, carbon and Kevlar. In addition, non-asbestos organic brake pads have filler materials and high-temperature resins. These pads are softer and quieter than other types of pads, but they wear faster and create more brake dust. These types of brake pads are made from an organic formula mixed with small (10 to 30 percent) amounts of copper or steel to help with heat transfer and provide better breaking. With the added metal, there is more break dust and they might be slightly noisier. These are composed of ceramic fibers, nonferrous filler materials, bonding agents and possibly small amounts of metal. They are lighter in color and more expensive than other brake pads and are cleaner and quieter. In addition, they offer excellent braking without wearing down the rotors. Most ceramic-based linings perform well in a wide variety of areas; but for some, other materials work just as well – if not better. Ceramic is not a generic term for a type of friction material – it is a description that covers a wide spectrum of friction materials. The only thing they have in common is that they contain some kind of ceramic as an ingredient. Some manufacturers believe in a best-fit method of installing brake pads: no one brake pad will perform the best on each and every vehicle on the market. Finding the brake pad that works best for your car may take trial and error to discover which material and types of brake pads you prefer.